Steve here with a quick note. After I saw that Lord of Chaos I sent an email to Eden to ask what she thought of the film. I was curious because she's familiar enough with the Black Metal scene that I wanted to know her take. She hadn't seen it yet so when the film’s release was announced I arranged for her to see the film because I feel her perspective, as someone who is familiar with the music, the events and life adds a great deal to how we should see the film. What follows is her thoughts on the film. 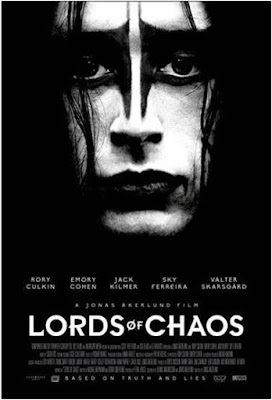 In a voiceover that starts off Lords of Chaos, Euronymous (Rory Culkin) says this will end badly for him. If you’ve heard of black metal, this is probably the one story you know about it -- a band called Mayhem whose history involved a bloody suicide, church burnings and an eventually murder. To be fair, it’s not like Norwegian black metal is all puppies and kittens -- far from it. The music is heavy and often deals with a lot of darker issues. And certainly, this story has the most drama, but it just reinforces everyone’s worst opinions of what black metal is. On the surface, Jonas Åkerlund is not a bad choice to tell this story. He was in black metal band Bathory early in its history and he clearly has experience in the music industry and an affection for darker imagery. Strangely, though, it’s impossible to tell where his sympathy lies here. Lords of Chaos is all over the place, tonally. Sometimes it seems like he’s expressing great empathy for these kids whose lives just ran away with them; other times it seems like he’s cruelly mocking them for being self-involved idiots. While it would be fine if the movie landed somewhere in between the two, it just mostly feels like Åkerland couldn’t make up his mind. Consequently, I really felt nothing -- neither pity nor contempt. I think the suicide of Dead (Jack Kilmer) is a great representation of this. Dead is supposed to be fascinating and magnetic but he’s not in the movie long enough for us to care about him. His bloody suicide, which should be emotional, goes on too long and just seems to revel in the gory special effects. It also never dives deep enough into what they were rebelling against. Norway did have a state church at the time, and these characters had privileged backgrounds (Eronymous’ dad helped him open his record store; Varg’s mom loaned him money to record his album) but we’re never given a clear sense about what they were angry about, specifically. We don’t know why black metal came out of this environment. There are glimpses of what this movie could be when they’re just hanging out eating shawarma or drinking in bars. Those brief insights remind us that these are real people. Even Varg (Emory Cohen) starting out as a shy poser who wants to hang with the cool kids feels real … until it doesn’t. It’s at least a stylish movie. Åkerlund has a great visual eye and while some of his music-video tricks are restrained here, he gives it a dynamic pace. The first half feels stronger than the first, though, and the second half feels like it’s just moving all the pieces into place for the inevitable outcome. And speaking of that, Euronymous’ killing at the hands of Varg is surprisingly emotional, but even the effect of that is minimized by how long its dragged out. The movie didn’t build the relationships strong enough for us to fully care. Euronymous is dead and Varg goes to jail. Black metal lives on. Or something. Ultimately, I’m not sure who this is movie is for. If you already know the story, it’s not going to offer any more insights into who these people were or the whys of black metal and it may actively offend you. If you don’t already know the story, the moral seems to be “black metal is bad,” which seems like a weird takeaway coming from Åkerlund. 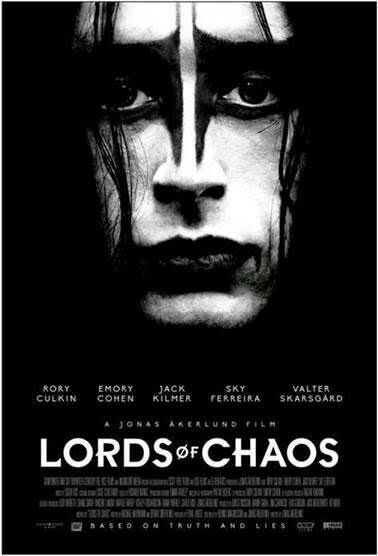 Black metal is about more than that “one psycho and a few confused kids” (as someone I know concisely put it) but Lords of Chaos will leave you thinking that’s all there is. And that’s a shame. I can only hope it inspires people to read more about and listen more. I know I did want to go listen to more black metal after I watched this. At least there’s that.